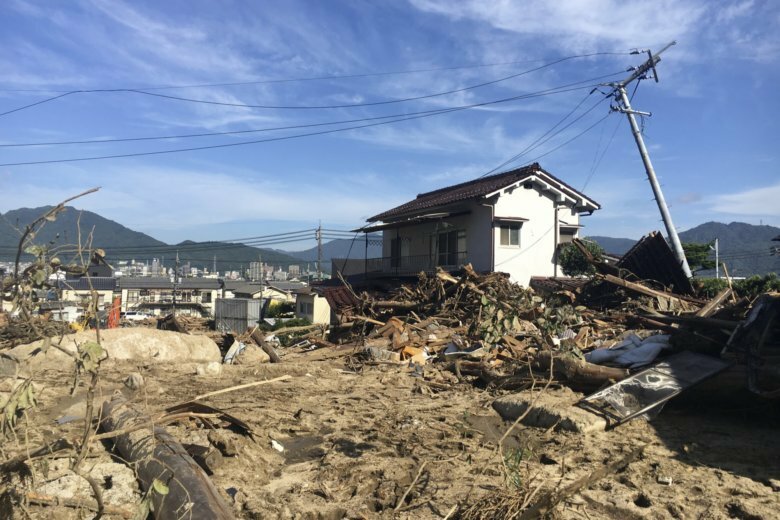 HIROSHIMA, Japan (AP) — Residents shoveled mud and debris to clear streets so they could get out for food and other supplies Wednesday in areas of western Japan hard hit by landslides and flooding that still swamped some areas. Prime Minister Shinzo Abe visited an evacuation center in the city of Kurashiki in Okayama prefecture, where more than 40 of the 176 victims died. He ducked in front of an elderly woman sitting on the floor, and pledged to her that his government will do its utmost to bring back her ordinary life as soon as possible. About 200 residents were taking refuge at the shelter he visited. In Hiroshima’s Asakita ward, resident Nobuaki Hyuga walked to a neighborhood convenience store but could only find ice cream and juices, so he had to go further to find bread and other foods. “We are cut off from the road and we can’t go anywhere by car,” Hyuga said.